Should parents be concerned about MiraLAX side effects in kids? 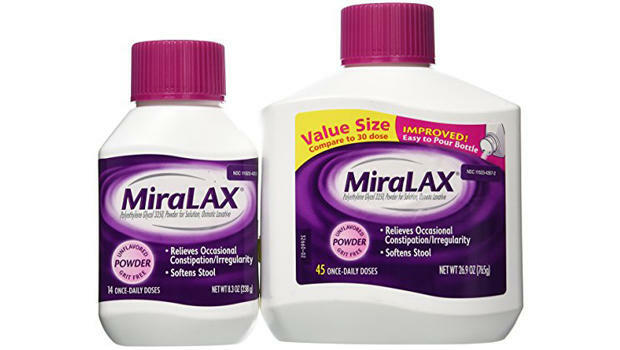 When children suffer from constipation, many parents turn to over-the-counter laxatives like MiraLAX for relief. Pediatricians often recommend them. But some families are raising concerns about safety and sharing alarming accounts of apparent side effects in their kids. An ongoing study is looking into the safety of the popular medication in response to reports that a number of children developed “neuropsychiatric problems” after taking MiraLAX. While the FDA awarded a grant to CHOP to investigate the possible side effects in 2014, the story is once again making headlines after a report from a local Philadelphia news station voicing parents’ concerns. Families told WPVI-TV that after taking MiraLAX their children experienced mood and behavioral changes, including depression, anger, anxiety, and mood swings. “We saw a lot of the anger, a lot of the rage, a lot of the aggression,” parent Mike Kohler told the station. How great a concern are such claims, and is there proof that MiraLAX is the cause of the problems? Pediatric neurologist Dr. Jonathan Mink, MD, says that while the jury is still out, there are other likely scenarios that might explain the issues these parents reported. “I see an awful lot of children who have neurobehavioral syndromes like Tourette syndrome, attention deficit hyperactivity disorder, autism, and anxiety and constipation is a common problem in those children,” he told CBS News. Though the exact connection is unclear, the nature of these disorders likely has something to do with it, as nerve cells and muscles also control bowel function, explained Mink, who serves on the executive committee of the American Academy of Pediatrics’ Section on Neurology and is president of the Child Neurology Society. That raises the possibility that problems the parents observed may have been due to an underlying condition rather than the medication itself. In 2014, the FDA reported 167 adverse side effects in children who had taken MiraLAX, 37 of which included neurological or psychiatric responses. But after reviewing these cases, the agency said there was not enough evidence to change or add any additional warnings to the drug’s label. Mink says he believes the study will eventually help provide more concrete answers. “I think it’s important that the study is going on to look into this because the concern has been raised,” he said. However, for children with chronic constipation for which alternative treatments have not worked, Mink says he believes MiraLAX is likely safe to use. He notes that although MiraLAX isn’t approved by the FDA for use in children, it doesn’t mean it is not safe. “For pediatricians and pediatric sub-specialists, there are many treatments that we offer to children who have very serious symptoms that have not been approved by the FDA for use in children. And that’s not because they’re not necessarily safe for use in children, it’s because the studies have not been done in a way that has led to FDA approval,” he said.